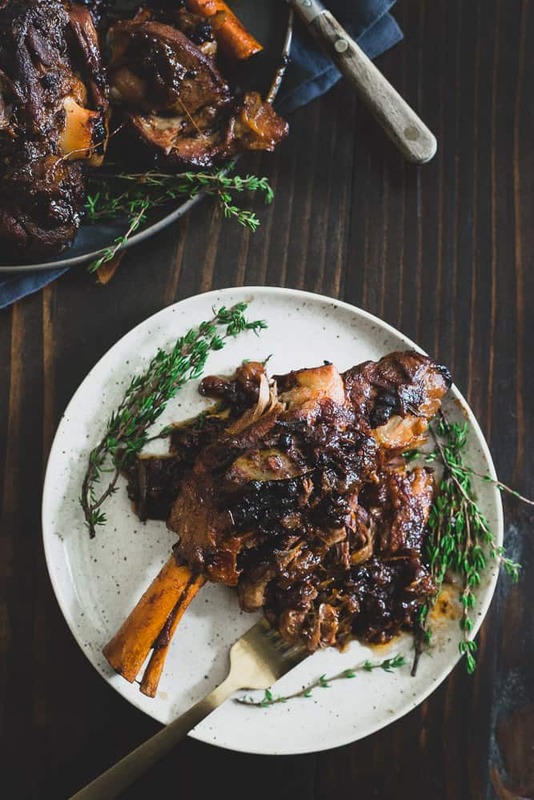 These apple cider braised lamb shanks are fall off the bone tender with caramelized, crispy bits and sweet apple and onion slices. Apple season is a big deal here in NY. Every weekend, droves of people from the city invade our local orchards making a spectacle of picking apples off trees and getting in their yearly “farm experience”. The amount of traffic and congestion they bring to the roads and local farms is so off-putting we don’t even bother with the whole ordeal any more or, at least make sure to go during the week instead. Thankfully, I don’t really care about apple picking or apples in general for that matter (they’re just not my favorite fruit) but apple cider (and apple cider donuts!) are a whole other matter entirely. Ulysses will happily guzzle apple cider straight from the container like he’s a small child but I prefer to find ways to cook with it instead. 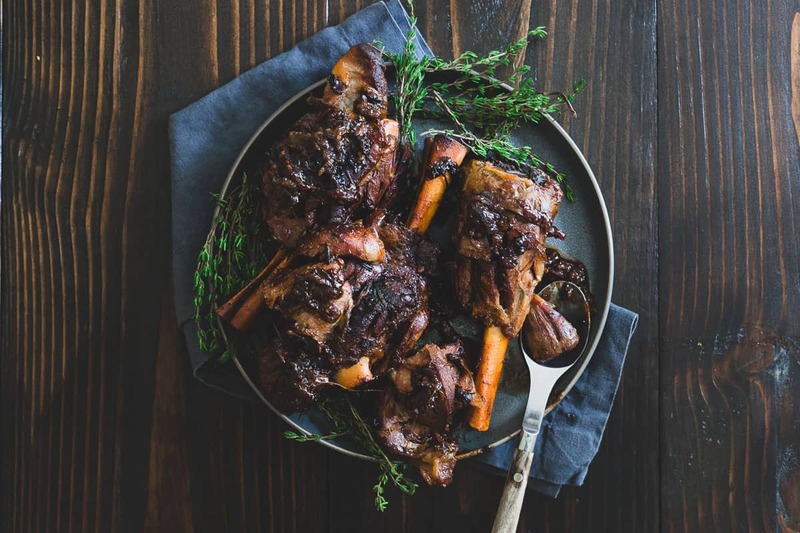 Its sweet (but not overly so like apple juice) flavor along with that little bit of tang makes it an excellent choice for throwing in soups, stews and meat pairings this time of year and it’s what immediately came to mind for these gorgeous family owned farm raised American lamb shanks. Sub the apple juice for apple cider in these sticky maple apple ribs! You know those weekend days where you just have the urge to cook something long and slow on the stovetop and fill the house with the aroma of something delicious to come for dinner? This apple cider braised lamb is just the thing for those days. This might sound weird to say but the smell that comes from lamb braising in apple cider with shallots and apple slices for 2+ hours is something you’ll want to bottle up into a candle. Brandy was over the day I made this and her reaction when she walked in was “it smells like a savory apple crisp in here!”. <– THAT. Braising is my absolute favorite way to cook meat in the fall and winter. After 2 hours the lamb just literally melts off the bone, the cider reduces to a thick caramelized sauce with soft apple slices and crispy little bits of meat and shallot. With 4 large lamb shanks, you’ll either need a pot large enough to accommodate (my 7 1/4 quart Dutch oven was large enough to fit all the lamb) or you can split the recipe into 2 pots. I mention two ways to cook the lamb (stove-top and in the oven) in the recipe directions below. I actually did both and have a slight preference for the oven method which results in a slightly crispier exterior to the lamb and a more reduced/thickened sauce but both options are equally delicious. Serve with your favorite hearty carb like mashed potatoes or gnocchi, devour and enjoy because this recipe definitely won’t leave anything leftover. 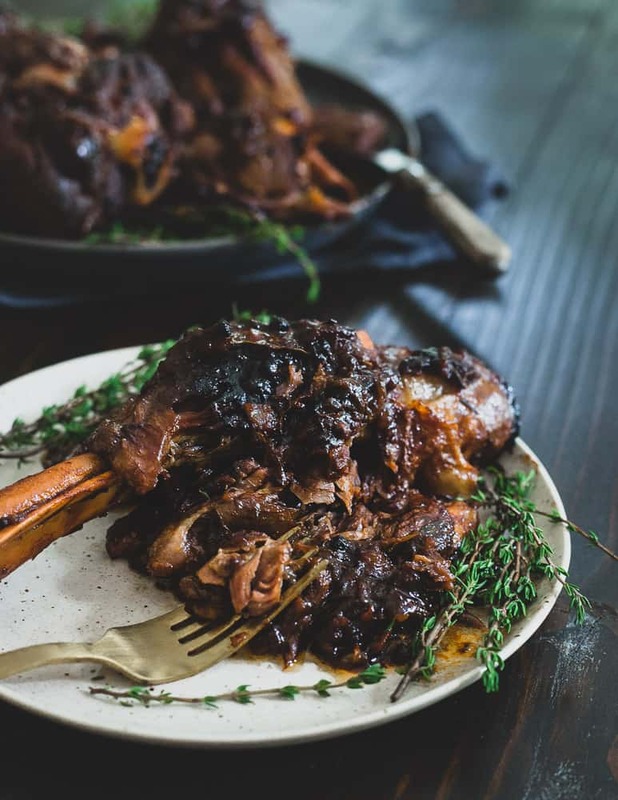 Watch the video below in the recipe card to see how simple it is to make these apple cider braised lamb shanks! 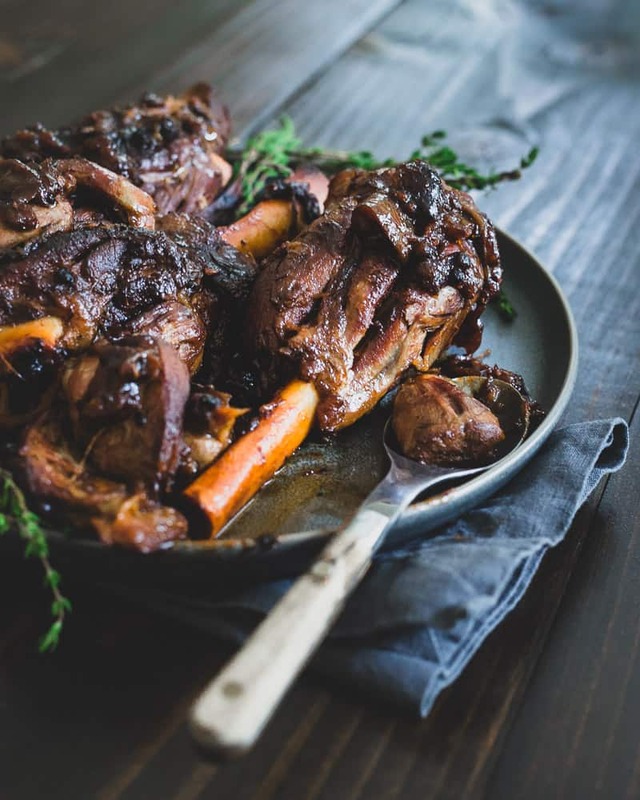 Love this recipe for apple cider braised lamb shanks? Try spicy skillet lamb ragu or Moroccan lamb lentil stew for more hearty and cozy lamb recipes. Season the lamb generously with salt and pepper. Combine rosemary, thyme, tomato paste, garlic, cinnamon and allspice in a small bowl. Stir together until a well combined paste forms. Rub the paste liberally all over each lamb shank. Place olive oil in a large pot or Dutch oven on the stove over medium-high heat. Place lamb shanks in the pot once hot and brown on all sides. Add the peppercorns, bay leaf, apple slices and shallots (or onions) to the pot. Pour the apple cider and broth over top and gently stir. Bring to a boil then cover the pot, reduce the heat to low and cook for 2.5 hours turning the shanks every 30 minutes or so while cooking. *Alternatively, you can cook in the oven at 325°F for the same time. *Cooking inside the oven will result in a slightly more caramelized, thickened/reduced sauce (think lots of crispy bits) than the stove-top method. Either work wonderfully, it just depends on your preference for the dish. What is cider beer? Hard cider? And to the writer from the UK, apple juice, apple cider and hard cider are 3 different things in the US. Apple juice tends to be a clear, sweetened apple juice; apple cider is pressed apple juice without any filtering or added sweetness; hard cider is an alcoholic beverage, often lightly sparkling due to fermentation, typically around 4-5% alcohol and can range from sweet and appley to tart to dry like champagne. In Michigan USA, where I live, you can find more styles of hard cider than styles of beer, and usually an appley version works well in recipes vs. dry. I can’t get over how gorgeously braised these are! Absolutely mouthwatering!